Last week a woman who knows us only slightly asked Eleanor if we ever rent our Airstream to other people. 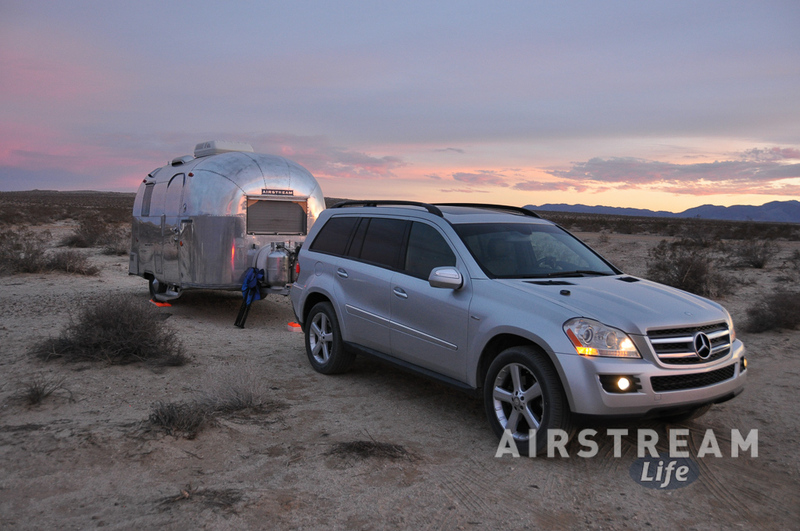 She wanted to see if an Airstream might be right for her family and thought she could evaluate it by trying ours first. Perhaps more to the point, she noted it would also be useful as housing for her visiting sister for a few days. The idea comes up now and again, but to date we’ve always passed over the opportunity to collect a few dollars. An Airstream is very personal, especially to us since we’ve lived in ours for several years (cumulatively) including a three year period of full time travel. Renting it to a stranger would feel like an invasion of privacy. 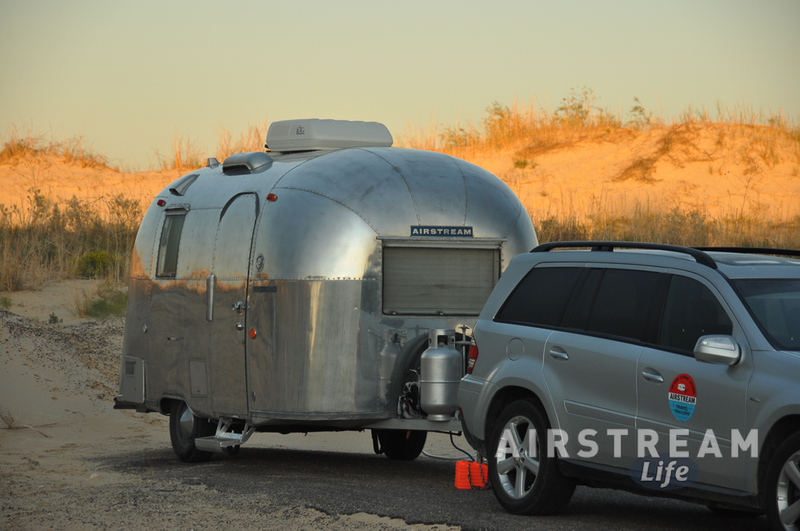 Lots of interest in Airstreams in general. For the past four years Airstream has been selling as many trailers & motorhomes as they can make and there’s no sign of a slowdown yet. Those of us in the business think the Baby Boomer retirement tidal wave may propel the RV industry for up to 10 more years. So people who can’t afford an Airstream or who don’t think they’ll use one enough to justify a purchase are looking to borrow or rent instead. Ten years ago I had to search around for the few places in the world where you could rent an Airstream “hotel room”. 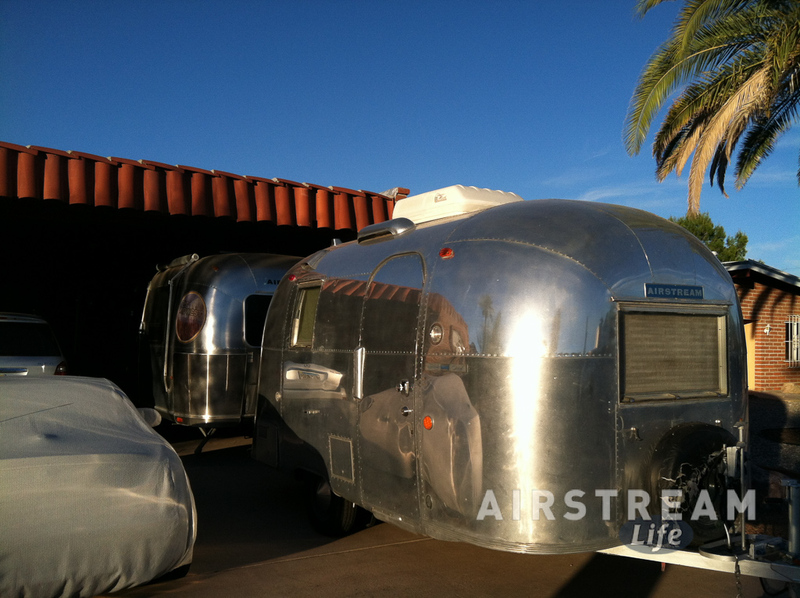 These days there are literally hundreds of Airstream hotel rooms (at dozens of locations) and more keep popping up. That’s a trend that I suspect may be a bubble and I’m wondering how soon it will pop. It might be hard to resist the call when someone is willing to pay $100-200 a night to sleep in your Airstream—until you look at the risk and expenses. The woman who inquired most recently wanted us to put the trailer on her land. Let’s see, that’s about two hours of my time for hitching up, towing across town, unhitching, setting up utilities, and explaining how to use everything. Then there’s the time spent getting the trailer ready for guests, which we do often in the winter for friends. That normally takes a couple more hours, including doing the sheets & towels, stocking a little food & coffee, and removing our personal items. Afterward of course there’s cleanup and more laundry. Finally, there’s the hassle factor. One set of friends had a little boy who didn’t get the memo on how to flush the toilet, so he filled the black tank in the first evening. When I was called the water level was within half an inch of overflowing the toilet bowl. If we didn’t have a handy sewer hookup in the carport that would have been a massive problem. Another guest left such a mess (I’ll spare the details) that it took several hours to restore the trailer to habitable condition. (That person was put on double-secret probation, which means “never again”.) And we take precautions even with our friends: dogs are carefully screened and smokers are forbidden. Fortunately we’ve never had any permanent damage but there’s no question being an innkeeper comes with certain risks. But what about the idea of buying a used Airstream cheap and then setting it up as a permanent rental? Sure, lots of people are doing that. From what they tell me, there’s not much of a business model in renting to individuals but the corporate rental gigs can be nicely profitable—when you can get them. The “cute” vintage trailers tend to get the biggest bucks, as long as they look nice. Personally I’ve been offered as much as $2,000 for “three days” of rental of our 1968 Caravel (pictured above) at a trade show, but in the end we’ve never actually gone through with a rental deal. The $2,000 was predicated on my towing it for six hours up to Las Vegas, and there were load-in and load-out dates that had to be respected so my total time investment was going to be nearly a week. It just didn’t make sense once I factored in my time, travel mileage, and either airfare or hotel for several days—not to mention the risks associated with putting a delicate vintage trailer in the middle of a trade show floor. So in my opinion there are a lot of problems with the “sharing economy” at least as far as it applies to Airstreams. Still, I would like to find a way to either make the Caravel stop costing us money every year (insurance, minor upkeep) and get it out of our carport. We hardly ever use it and two Airstreams are too much for a suburban driveway. But like an elderly pet, the Caravel is so beloved that we can’t just get rid of it. Right now the grand plan is for Emma to inherit the Caravel at some point. I wonder if that will actually happen. A characteristic of her generation that I’ve been noting lately is they don’t want their parents’ stuff. [See articles: 1, 2, 3, 4] It’s not just the silver tea set and ridiculously formal dining room furniture they don’t want. This allergy extends to pretty much all the material goods. The kids want to make their own lives, not duplicate ours—and they are accustomed to getting the latest new version of everything every year or two. Big sigh. I can relate to that. I never wanted anything of my parents’ either. They gave me a rusty 1977 Chevy Camaro in 1984 and it was helpful for a while during college, but once I had my first post-college job I preferred to buy my own stuff even if I had to take out a loan to do it. Fortunately there are always going to be a subset of American society that values nice old vehicles, and if Emma doesn’t show marked interest in the Caravel someday one of those other folks will get it instead. And now that I think of it, there’s the original “sharing economy”: If you don’t need it, sell it to someone who will use it. 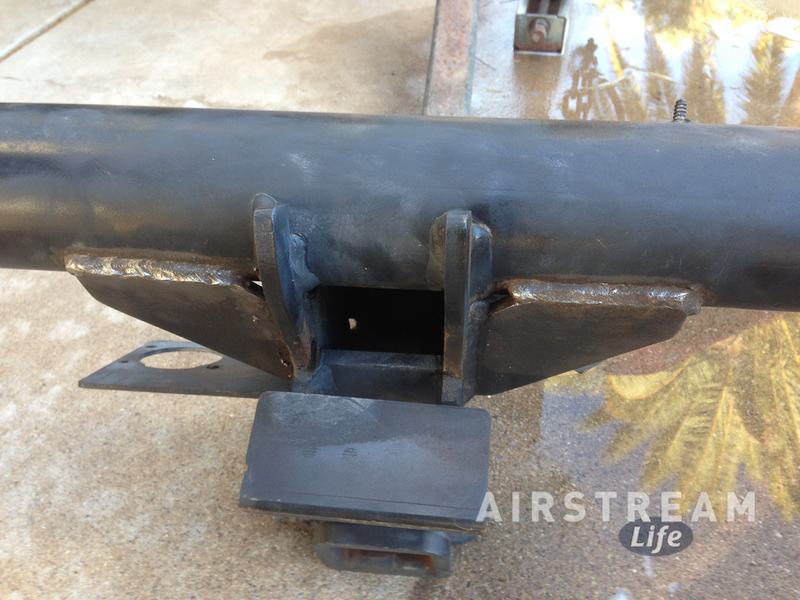 Airstreams last a long time with proper care. I think I’ll offset my costs by keeping mine in good shape and hopefully someday sell it and get my money back, or make a little bit on appreciation. I’ve put off my major Airstream and car projects since we got back to home base in October. Now it’s time to get going. 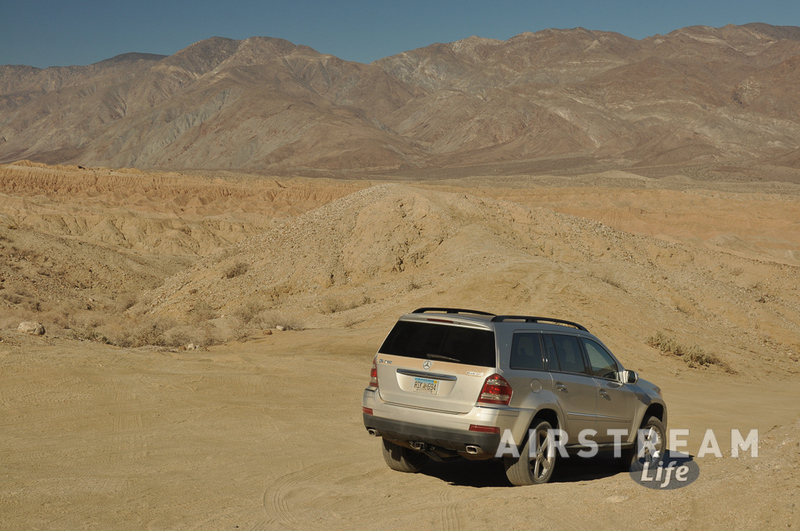 Our trusty tow vehicle (and regular consumer of spare parts), the Mercedes GL320, has a problem involving the diesel exhaust fluid (DEF) tank heater that I’ve decided to fix myself. The dealership will gladly do this job for $2,000 but I’m hoping Nick and I can tackle it for less than $400. I’ll blog that later, once it’s done. The DEF tank on our car is trapped by the central reinforcement of the receiver hitch, so to get it out for the repair I have to remove the entire hitch. Since it was out, I figured this was a good opportunity to do a hitch inspection. I casually check it every year but haven’t really done a thorough inspection since April 2012. 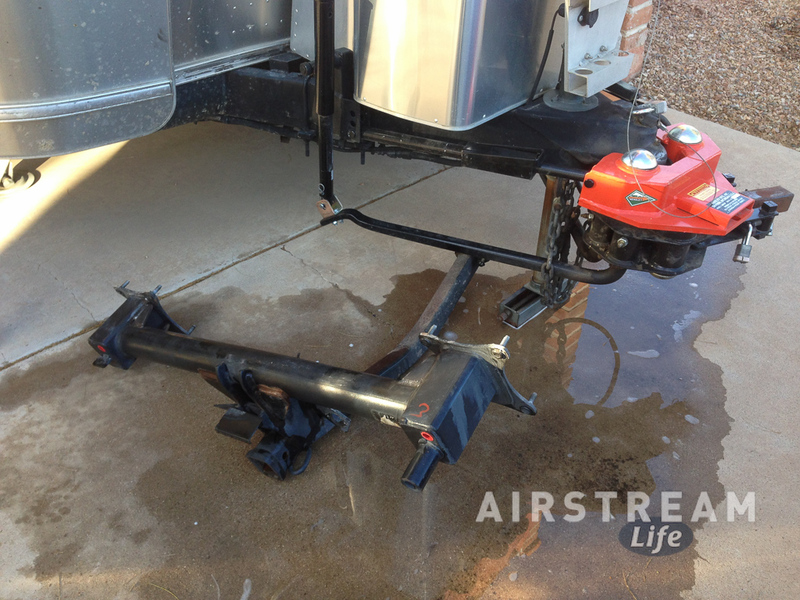 By the way, you don’t have to remove your hitch to check it. You can just get under the car with a flashlight like I described in an earlier post. It’s just a little harder to see everything that way. Our hitch looked pretty good. 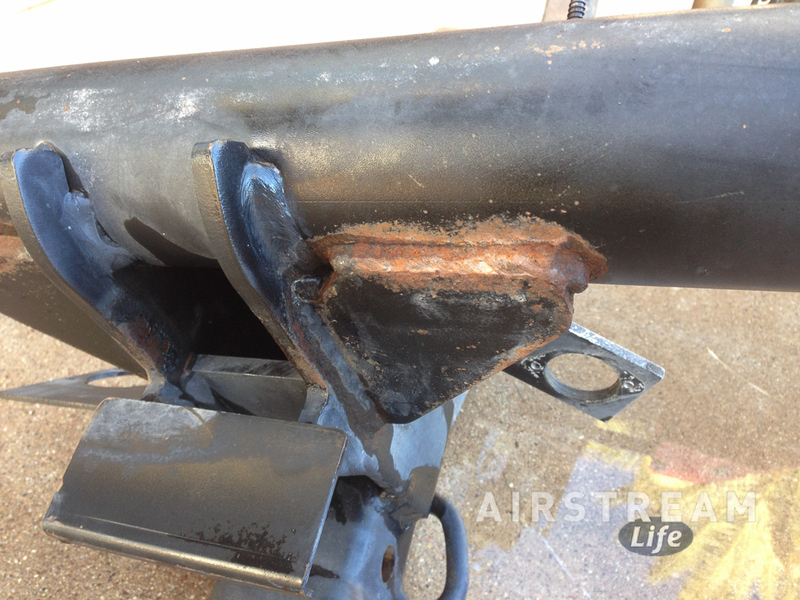 After washing off the hitch I saw the usual surface rust, particularly around welds where we’d added reinforcing gussets, which was expected. 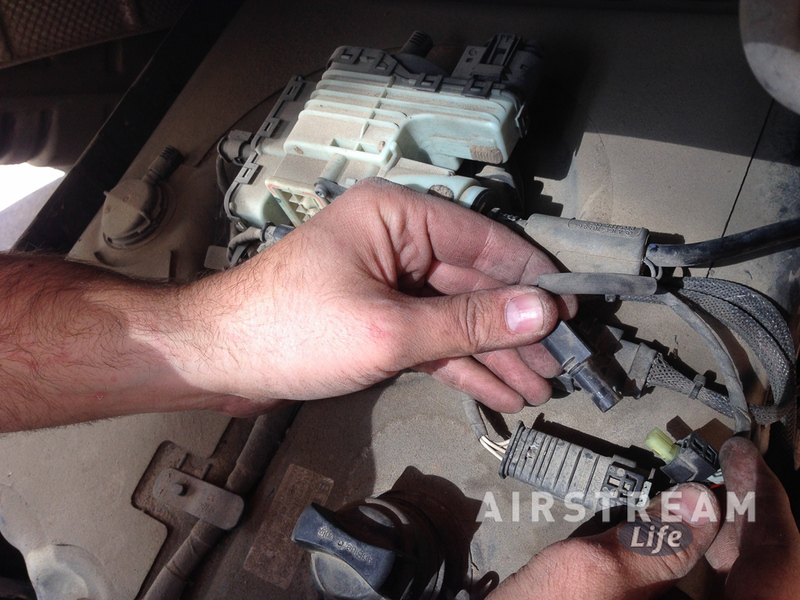 Nothing jumped out as suspicious, so this job was limited to washing the dust off, wire-brushing the rust (with a rotary brush in a cordless drill), roughing up the painted surfaces with the brush, and repainting. It took less than 30 minutes to do it all. In the photo above you can see the welds after they’ve been wire-brushed. Nice shiny metal, and best of all no cracks. I found a small amount of stretching in the receiver box (fairly normal considering this hitch has towed for about 100,000 miles) and one factory weld with a slight gap that’s probably been there since it was made. Nothing to worry about. This hitch is ready to go back on the car. 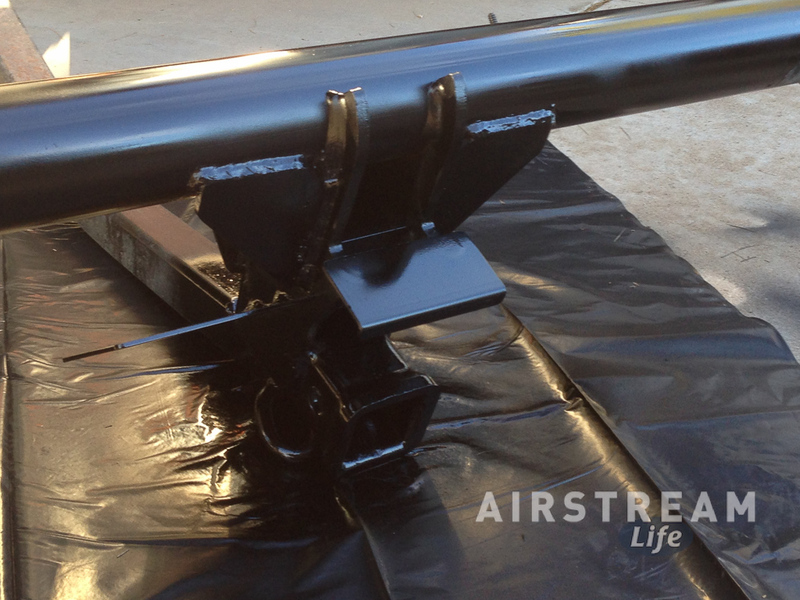 And finally, with a quick touch-up coat of glossy black spray paint, it looks like new again … for the third or fourth time. I know a lot of you are in the snow right now, so the idea of crawling under your tow vehicle to do a hitch inspection is probably not appealing. 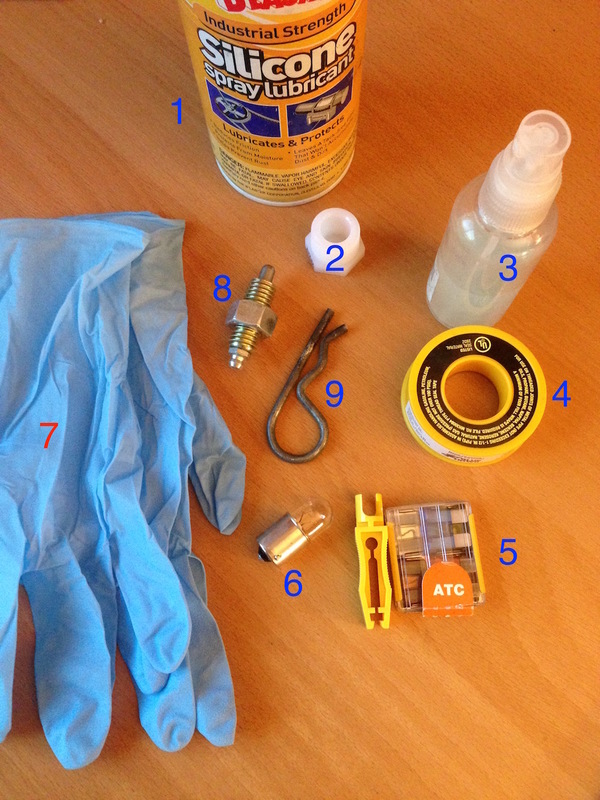 I suggest you put it on your list for spring maintenance, right before you start going camping again. 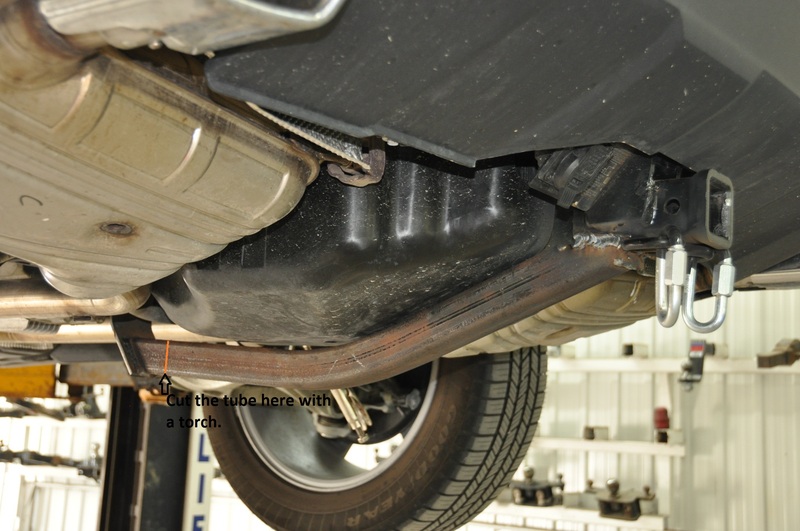 A hitch inspection takes only a few minutes and can save you from a ton of hassle.